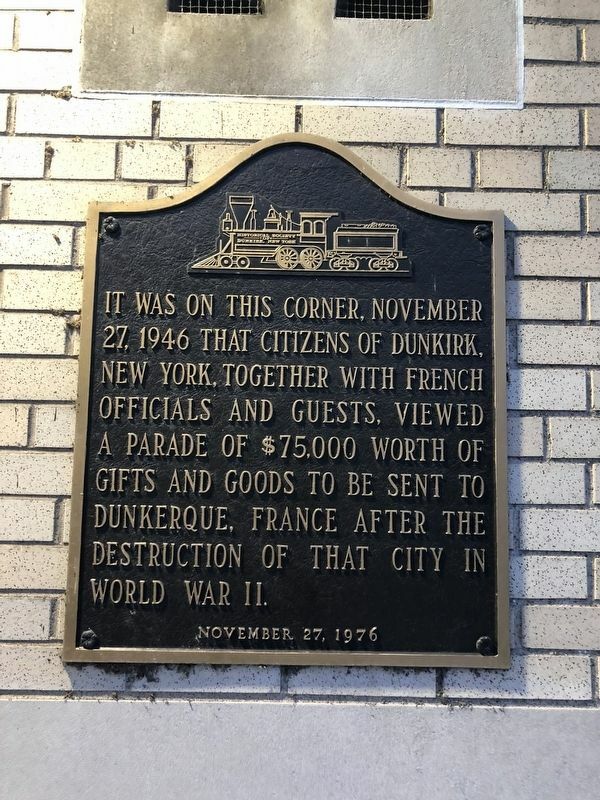 It was on this corner, November 27, 1946 that citizens of Dunkirk, New York, together with French officials and guests, viewed a parade of $75,000 worth of gifts and goods to be sent to Dunkerque, France after the destruction of that city in World War II. Location. 42° 28.98′ N, 79° 20.073′ W. Marker is in Dunkirk, New York, in Chautauqua County. Marker is at the intersection of Central Avenue and East 4th Street, on the left when traveling north on Central Avenue. Touch for map. 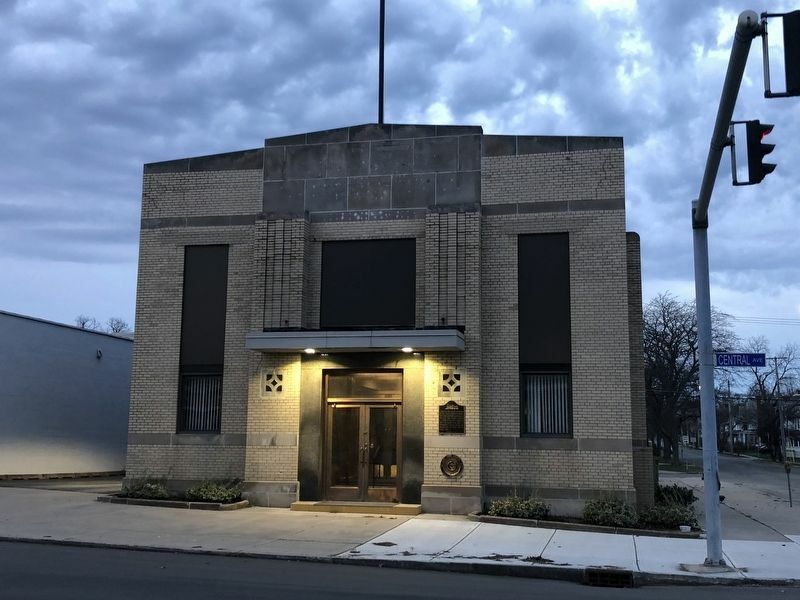 Marker is at or near this postal address: 401 Central Avenue, Dunkirk NY 14048, United States of America. Touch for directions. Other nearby markers. At least 8 other markers are within walking distance of this marker. Naetzker Garden (about 300 feet away, measured in a direct line); Cdr. Harry B. Lyon D.D.S. (approx. 0.4 miles away); To All That Served Honorably (approx. 0.4 miles away); War on Terrorism Memorial (approx. 0.4 miles away); Dedicated 1975 (approx. 0.4 miles away); POW★MIA (approx. 0.4 miles away); To All Who Served (approx. 0.4 miles away); B.P.O. Elks (approx. 0.4 miles away). Touch for a list and map of all markers in Dunkirk. More. Search the internet for Dunkirk Parade. Credits. This page was last revised on April 15, 2019. This page originally submitted on April 15, 2019, by Devry Becker Jones of Washington, District of Columbia. This page has been viewed 34 times since then. Photos: 1, 2. submitted on April 15, 2019, by Devry Becker Jones of Washington, District of Columbia.